NEVER say NEVER I guess the tone was set long before July 30, 2002, when Sotheby’s Auction House in New York City, auctioned the world famous 1933 $20,that the Government had seized from a British coin dealer. When David Redden, vice chairman of Sotheby’s, announced to the crowded room that the supremacy clause of the Constitution precluded the collection of sales tax on this coin, the heavy hand of Government was again evident. 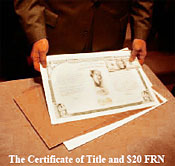 U.S. Mint Director Henrietta Holsman Fore received a $20 Federal Reserve note in payment for the $20 gold coin, demonstrating that, at law, there is no difference between a paper note and a gold coin. What remains so very perplexing is the claim that this is the only 1933 Double Eagle example that will ever be authorized for private ownership by the United States Government. Ahh, so pretentious. Let’s borrow every dollar we can and buy this thing. 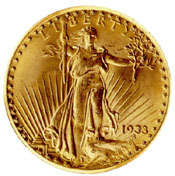 The 1933 gold double eagles were originally intended for legal tender circulation. Several made it out of the mint, more might exist. Who knows what a future Government might do? Never say never is my motto. 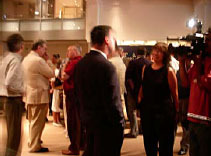 The more than 700 people present demonstrated the desirability of real gold money. Bidding for the last U.S. $20 gold piece issued, commenced at $2.5 million. In about 8 minutes of frenzied activity, the gavel came down setting the final price at $7.6 million. The transfer title will be presented to the new owner, who evidently aware of the non-reportable status of U.S. rare coins, chose to remain anonymous. The 7.5 million will be divided between the Mint, Sotheby’s and Stephen Fenton, the British coin dealer from whom the coin was seized. I guess money is better than justice. Our own Matt DuHaime shares perspective with NBC reporter.